The Great Alignment, returning to the Great Light. Namaste and I send you much love and light, always. Here is a crop circle that is very, very deep in multidimensional ways, like all crop circles are. When we learn one angle, a whole new learning opens and this is how we advance forward, always. We are here to learn how to open our minds up to becoming unlimited, stepping into deeper gifts and powers within us to harmonize with higher energies which are powerful because they, the higher energies, are great love and light energies. In this crop circle, it explores the game of the Universe and how everything comes back to the light. Please follow the teachings of CAEAYARON on You Tube to find deeper answers to your questions as he explains the game of the universe, why we were created, where planet earth comes from, where we are going, how we ascend together. Here it shows the very distant past, and also our future. After that, the dark beings of the dark planet didn’t want the light upon their planet, and like CAEAYARON and HALISARIUS also describe it (up on you tube) a whole part of the planet, which became our planet, was ‘catapulted,’ or ‘belted’ out to a whole other part of the universe, together with several other of its planets, which are now part of our milky way system. After that the greater dimensions were created and Lemuria came into place to place great light into the earth. Many star beings from the evolved realms came to Lemuria as they wanted love and light upon our planet also because this was the planet of balance as it was the planet where all would be seen. If we could bring this planet back to the love and the light and all beings on this planet to the love and the light, that would answer the question once and for all that the Rebellious ones raised. It would show, that even though the great love was taken away from us at the fall, it was strong enough to return to the great love. They stated very strongly that we would never rise again in our love. If we didn’t come back to the love and the light, the rebellious ones were promised they could war again in the galaxies and the battles would start all over again. While the games were played upon our plane, the rebellious had to leave all other universes of love alone, so all the universes, at this moment, are keenly watching to see what we will do. In Lemuria, the Lemurians were given sacred light codes and this created a greater platform for the whole balance to return to the universe. They, the Lemurians were given sacred keys in Ancient Lemuria to bring through greater gifts for not only our planet, but also all other star beings, because this is their reward for coming here to this planet with their love, to prove to the darkness that love and light is stronger than all the darkness put together. They were given sacred transmissions by CAEAYARON who used the three light grid programmers, Reuben, Harmonic Frequencies, Suzanna, Divine Love Element, and Ishmakael, Sacred Light Geometry (shown by the three circles at the bottom of the image connected to the brown platform). These transmissions were received by the people of Lemuria with their pineal glands, which were alive and lit up at that time. This kept the whole dimension up high, and the people lived in love. Their DNA level was very high and thus their happiness was great and their lives were long and healthy. After the fall of mankind the pineal glands were switched off, for the people now fell to a denser environment. They fell asleep into a deep amnesia state. They forgot love and light and being in the heart. Instead they fell into pain and anger. The fear was rampant. The greater purpose of the universe is to bring back everything to the light and living in harmony with each other. It desires all to come back to love and perfection which can only be done with collective love consciousness, when we desire to come back to the love collectively because our planet was given the gift of freedom to see what we would do with the choices. In 2014, CAEAYARON approached his light grid programmer, Suzanna (Lemurian name Laeayarasea) and awoke her to the Divine Purpose of the universe and that is to bring everyone back to the love and the harmony. She was to work with CAEAYARON to awaken the Sacred Lemurians to their Sacred Light Codes to awaken the great gifts within them to bring all into higher love alignment so that they, the Awakened Lemurians, could work together to bring all into collective awakening love together, receiving the love from CAEAYARON, connecting to the greater gifts and feeling the great strength within them returning. As CAEAYARON used light grid programmers in Lemuria and on other planets to bring higher light programmes to planets and people, he needed a light grid programmer here upon this plane today. Reuben and Ishmakael are not here upon our planet at this moment as they work hard on other levels aligning us higher on the greater realms, helping people to connect to their deeper love codes, and preparing us for the Great Alignment coming, when we become One with the Greater Universe. It is now the time to step into the deeper harmony of the universe as the Great Alignment is coming, which this crop message is explaining. The Lemurians, who have come back to this plane at this time, need to connect to their higher codes once again, as they received the gifts (in Lemuria) to bring harmony, love, balance, restore peace, unity and greatness to our planet. These codes are held within the Crystalline Grid. These codes have been patiently waiting for us to become ready to receive them. We can only connect upwards when the same Divine Master, CAEAYARON, would awaken his Light Grid Programmer, and then connect the people back to the light codes with pineal gland activations. CAEAYARON is magnetic force and the sounds awakens the pineal gland, which align the chakras. The whole energy body of the person who is becoming awakened with the activations, reaches into a much higher dimension and thus this person can be linked into their codes and slowly the codes transmit back to that person, giving them greater gifts of love. It takes time to adjust to a greater frequency, and also we cannot reach the greater, greater frequencies within our codes, until many become awakened and many step into their higher codes, as our whole dimension shifts with our awakening, and the greater the dimensions shift upwards, the greater we can reach our higher codes. This is a very beautiful process for those who desire the pineal gland activations from CAEAYARON. After this the person who is activated awakens, heals, desires more love, their thoughts change, they manifest more love in their lives. They come into a higher healing system where all the activated people are connected into and together they heal, together they rise, together they work in love, collectively. Again, please watch the teachings from CAEAYARON if you desire to know more. Because the Universe is so loving, it steps down in dimensional flows to allow us to awaken. If you can imagine the large eye, being the Great Divine Eye of the Universe, (at the top of the image in yellow) holding all the codes for all our awakening, stepping it down for us (shown by the dimensions going down), helping us to be pulled up. The more we are pulled up with our sacred vibration, the greater we can bring our whole planet up collectively, until we reach such a stage of awakening humanity to the great love. 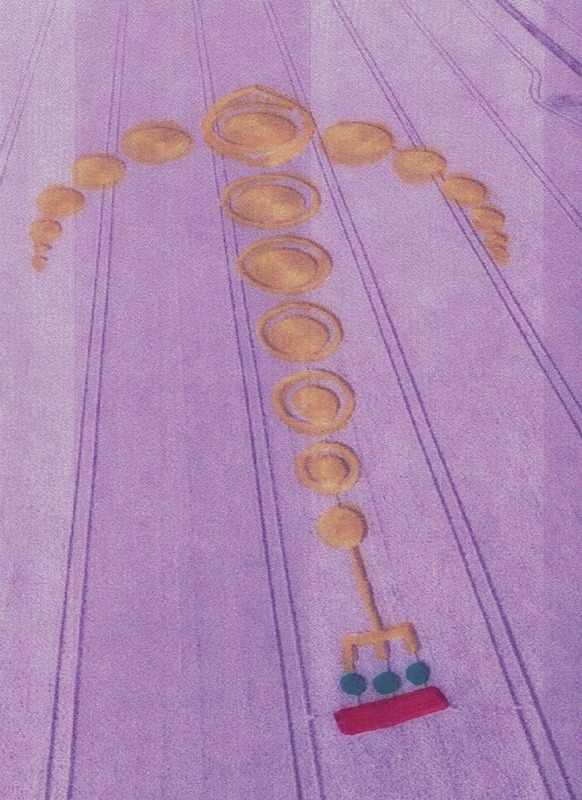 (The sacred wisdom from the eye coming down is shown by the outer rings of the yellow circles). We climb up slowly, as a collective, learning how to hold more love within ourselves, learning greater spiritual wisdom, until we meet the Great Eye of Divine Purpose, which wants us to work in harmony with the Divine Love of the Universe. The other planetary systems (shown on the side of the large eye)) are also working in collective love and harmony with Divine Will and here it shows how all planets, including us, can anchor in a greater foundation of love and harmony in the universe, as shown by the anchor image as a whole. We have, at this stage, stepped into a greater love consciousness, not only with our people here, but with the Greater Family of Light. At that time greater gates of higher evolution are opened. We then step into a whole new creation within ourselves, with more beauty and more love. * Brown platform: represents the darkest planet. * The green circles: Represents the three light grid programmers. * The yellow trident pointing at the three circles: The light grid programmers connecting to the darkest planets, creating a connection upwards. * The highest great yellow eye: Shows Divine purpose and Divine will. * The circles going down: Wisdom steps down, connecting to us, aligning us higher to higher purpose, bringing us up higher. * Circles on the side: shows planets who are connected to Divine Will and Divine Purpose collectively. Once we align up greater, we can join the greater Family of Light, stepping into greater purpose with Divine Collective Love Consciousness.